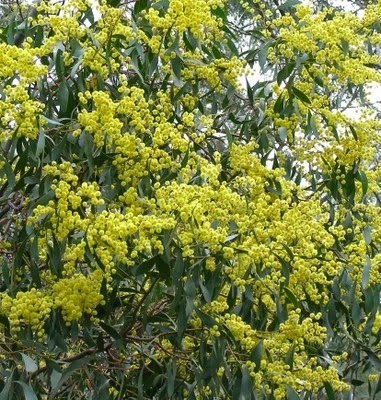 Even though there have been wattles out for many weeks September 1 is Wattle Day in Australia. A time to celebrate one of our most beautiful and evocative native plants. Wear a sprig of wattle or better still, plant a wattle in your garden this spring. 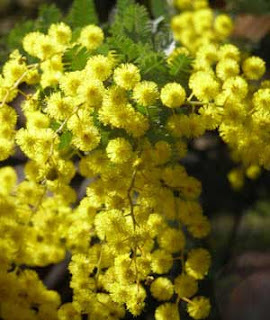 Not only will you be introducing a burst of sunlight yellow when the fluffy wattle flowers bloom, you will also be putting in a plant that will provide food for native birds. Wattle trees are also very fast growing and will quickly provide welcome shade and shelter in a newly established or exposed garden. By the same token they do not live long. The Golden Wattle (Acacia pycnantha) is Australia's official floral emblem. This beautiful species was proclaimed as our emblem on 1 September 1988 but it had been the unofficial floral emblem of Australia by popular choice for many years. It has appeared as a floral motif on many official government documents such as an adornment to the Commonwealth Coat of Arms adopted 19 September 1912.